By Shahid Khan In the cloud of hopelessness, disappointment and despair when our lives are besieged with news of wars, conflicts, terror, hunger and abject poverty in our world we tend to believe that everything in world will topple down sooner or later. We think that sustainability in life and things will begin to fade away and we all will be drowned with the sea of hopelessness. However, the inherent sense of hope is something which encourages us to keep our pecker up and face the challenges which the dear life throws at us. This acute feeling of braving the elements even when hope does not seems to exist at all is the astonishing and glaring characteristic of a human nature. It gives us more motivation and drive to do extra-ordinary things in our lives. Alexander Pope, an English writer in his essay on man said ” Hope springs eternal in the human breast”. We witness the existence of hope in the eyes of a solider standing in the face of a canon who is hoping for the freedom, or a prisoner in a solitary confinement hopes to witness the breadth of skies on day, or a farmer who tills the ground with sweat of his brow in a hope to bear fruits at the end of the year. Hope in our life is more present than we realize it. Without hope in our world, the whole systems of world will collapse. The sower will not sow the seed, if he would not hope that he would get the return, the businesses in our world will begin to fail if people will not aspire how this will bring them profit, the student will not study if there are no hopes for the better future. Hope is applicable to every being. What is your hope for the day? Are you hoping to live in a big house? Having bank balance, maybe trying to find a more comfortable life than you have at the moment. Think about the element of hope in the nature. Look at the birds how are they hopeful for the spring for instance. The wintery days of cold and night which for some is more sinister however it gives them the temerity to brave the elements and to push forward in a hope to chirp and sing when the weather will be milder and there will be more life and colour in the garden. Sometimes we, as humans are often taken by the immediate problems in our sight and feel this is going to be the end of the world. The problem-free world is more like a figment of the utopian world where everything is going to be smooth and fine. The harsh realities of the world is much more profound than they appear to be. Having a hope in one’s life is having a good friend at the time of adversity. Like a good friend, who is there to give you, support, comfort and help in the time of trouble, Hope does same to us. It necessarily does not take away the pain, however it helps us go on, It motivates us to face the challenges of the day. It keeps us on the track to achieve what we plan to endeavour. Life without hope is mere existence. Imagine if there is man, who has lost all his hope in and for the world. He is unmotivated to do things, his purposeless life will catch him even more than he could imagine, which will eventually do more harm to him than any good . The death of life is “giving up” on things . Many a times we all come to a point when we give in so easily. We feel that it is the end of the world. The death of a man begins with giving up things – which is the first step towards any kind of adversity. Hope is not a guarantee for a success. A hopeful person is not always a winner or a success, more often than not , having hopes develops our attitude and character towards the things of life. It rather invites us into challenges, stretches our limits and abilities and drive us into the un-called for and unwelcome area of “failure “. Which nobody in world would like to experience. But is “failure” the end of world ? Few days ago, while I was in the supermarket buying few things for my dinner, I heard a man shouting in the middle of shopping aisle “What an utter failure you are” as he whizzed by me while his partner was cringed in with fear and disappointment at their public verbal altercation. While thinking about this incident I thought to myself how things around our lives shape our beings, character and attitudes. This woman in question will never see the brighter sides of things if her life is pushed under such threat of negativity and hopelessness. Imagine if a child is told all the day long. “You are good for nothing” or “You are a failure” by his classmates, friends and families the poor child will grow and dwell on this failure which will later shape his life of hopelessness and despair . No matter how talented, capable he is, he will start thinking that he is a failure. Hope will have no room in his life due to the amount of negativity which has been fed into his life. Hope springs on the ground of positivity. The more bright and positive approach we have in our life. The more hopeful we are for the things in life. Being a hopeful does not mean you wink an eye on ground realities. Rather it makes you more aware of things ahead so that you can plan ahead and make the best decision possible. Hope is a choice. It is the decision which we would have to make either to have it or to live in despair and disappointment. Just look around the world and see how your life is blessed in the ways which you do not even realize. The life, the freedom, family and friends. Or having a meal a day. Imagine those who are deprived of such things in our world. The hope of the day is that may we cling to it. In spite of the challenges we are going through our lives. Your decision today will determine your future tomorrow. This entry was posted in Articles, Spiritual Articles and tagged Christian, hope, world. Bookmark the permalink. I suppose hope is what people want it to be, and varies of course from person to person and from moment to moment, as some of us many of us hope to die. To relieve ones suffering, to die in a cause, and as such enter heaven. Perhaps? And, so..Hope can be brutal as well as transcendent and restoring, it seems to depend on the person, and what they think and feel, how they might be. The very usual association of hope with something positive, it’s not such a bad thing, almost the nature of hope, to think positively. We, all of us, I think tend towards some degree of optimism, something will be better, can’t get worse etc.. Depression is by far the most hopeless feeling that I have encountered in my life, pernicious, blunt, destructive, hopeless. It makes sense to be hopeful in order to progress, otherwise there is no movement, but what when hope, the other more sinister hope that blinds people to the world in the raw, as it is and how truly frightening the world in which we live is. There is a million miles between hoping for a pay rise and hoping for end to human insanity. Profound hope seems to me to part of the substance of many great Faiths, something of life in another place, other than terrestrial human. I simply cannot accept this as way of thinking, but I can understand to some degree, why a great many people do. And so…Knowing of course that hope is essentially a futile gesture in in our transient passage, from here to there, why continue? Because, of course one does. A grim advantage to the negative mind, depressed the hope of hope is futile, and having the words give this experience some amount of substance, which has value ergo hope. A circular existential irony, and one deserved of a laugh! Well, in too brief a conclusion I reckon that hope is like oxygen, required for life!! Hi Donald, Thanks for your message. Hope I believe is like a blood to human life. You are quite right. Hope is who you are and where you are in your life as well . 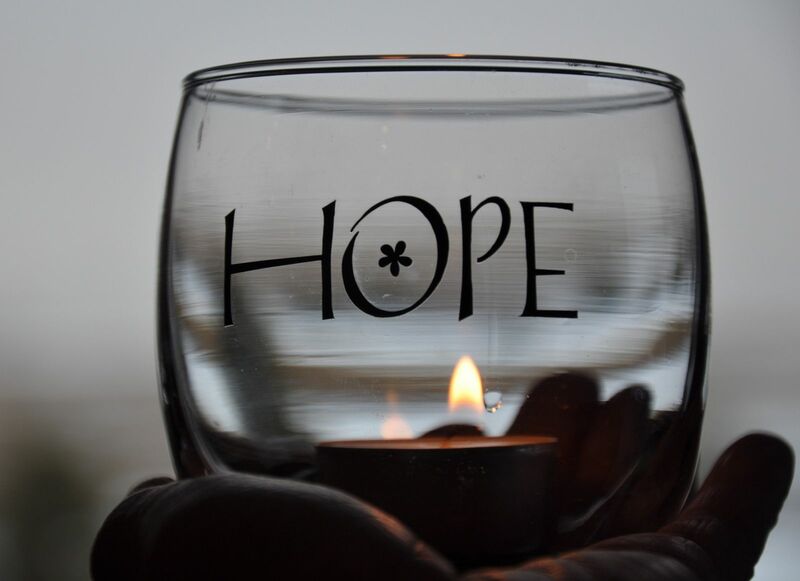 There are negative as well as positive aspects of hope. I believe hope as means to bridge towards goodness in life is what makes it worth following. We all tend to be fall in the whirlpool of hopelessness sooner or later . I see the images of the recent sectarian bomb attack on shiite community in Pakistan which claimed the lives of 91 people, the families of the victims are gutted with the loss of their loved ones as they stage a sit-in protest since Saturday and call for Army intervention due to the Government’s inability to protect their lives and rights. What is hope for them ? A mere distortion of truth ? I would love to hear more about the existential view of hope as you mentioned in your comment. This or that, I believe, without hope we can not take a step in our lives, let alone the whole passage of life here on earth .